Messages in iOS can grow to take up considerable storage space over time, particularly for users who frequently send and receive multimedia on an iPhone. Each photo taken with an iPhone camera can easily consume 4MB, and movies will take up even more space, and it’s not unusual for an iPhone user to eventually wind up with several GB of messages and attachments. 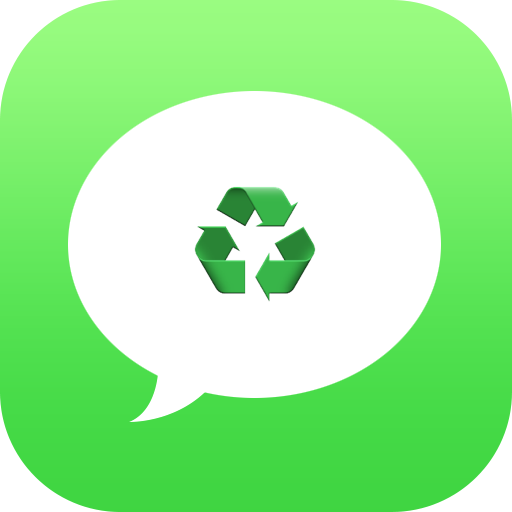 For users who don’t want to manage their own messages by deleting large messages, attached files, or old conversations, the latest iOS 8 introduces an option that will automatically delete old messages from your iPhone. This is a great feature but do realize that this completely deletes the old messages from iOS, and they will not be available in a backup either. Thus, you’ll only want to do this if you’re absolutely certain you do not want to access and read older messages on your iPhone. Of course this feature is also available on iPad and iPod touch as well, but it’s likely to be more popular with iPhone users, thus the focus. By default this feature is turned OFF, which means all your messages are kept on the device until manually removed. Only change this setting if you are certain you want old messages and their media attachments to be removed automatically. If you have messages older than the time you selected, you’ll see a new screen to confirm the old message removal. At the “Delete Older Messages?” panel, confirm that you want to remove all messages and their attached photos, audio, or video, that are older than the specified date. Once this setting is turned on, the rest is handled automatically. As soon as a specific message and/or message attachment expiration period of 30 days or 1 year has reached it will be completely removed from the device. It’s worth noting this is completely different from the automatic video removal feature in iOS that is turned ON by default for both audio and video messages, a feature which causes much more rapid expiration of multimedia content in the iOS Messages app. These two features can be used concurrently, however. 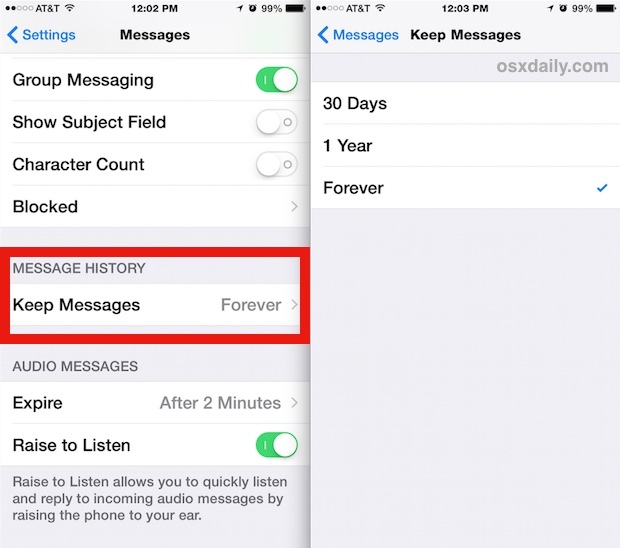 While this can be a good way to automatically manage outlandish Messages storage (which sometimes shows up as part of an enormously sized “Other” storage space in iTunes when an iOS device is connected), privacy buffs should also enjoy this feature, as it adds a layer of security to an iPhone or iPad by removing old conversations. If you decide you don’t like this, you can always reverse this setting and go back to the iOS default of “Never” to stop the automatic message deletion. I’m using the latest version of iOS on a 6 plus and I don’t have the “never option”. Just the Forever, 30 days, and 1 year. Can I assume that altho they are deleted off the iPhone, the same messages wont be deleted in the Cloud or on my Mac? Can you turn off the “Details” attachment feature? Same question as Alix. I’d love to free up space on my iPhone but like having all my email available on my laptop and desktop. I’ve set my settings to 30 days and I still have my old messages from 2 years ago..why do I still have my old messages? Because it hasn’t been 30 days since you enabled the setting, then your old messages will remove themselves. how can you read your old messages? I’ve had forever listed and it keeps deleting messages after one week or less. What’s wring? The new ipdate makes things worse, plus I’ll never get the watch and can’t delete that! I followed the steps but the second I exit, the check mark returns to “forver” and nothing is deleted. How do I fix this? Is there a similar feature for Mail? Early IOS, do not remember which, had a feature to select the maximum number of email msgs kept on the phone. That seems lost now. I’m same as Chris. I have one person that messages are being deleted automatically every 2 hours. On the screen, it says “erase all” and will not let me delete it. How do I get this turned off? Is there a way I can set my phone to where I can delete all message or where it want save messages. 31/01/2017 from Karin in SOUTH AUSTRALIA (=SA) from iphone 5. Help, I am just about snowed under with emails (gmails) that seem to be multiplying themselves over and over again. I have WELL over 64 Thousand emails in my gmail, apparently in more then 1 mailbox and well over 63 thousand emails in my Apple inbox etc. I would like to check my old gmails from many years ago,read them and delete most of them, but not sure how to do that. My iphone therefore is chockerblock full and that’s because those old emails are taking up a lot of space. Please can some1 out there advice me in plain English, what to do?? ?